For the last few months, I’ve received a steady stream of comments voicing concerns about the MTA’s approach to weekend service changes. 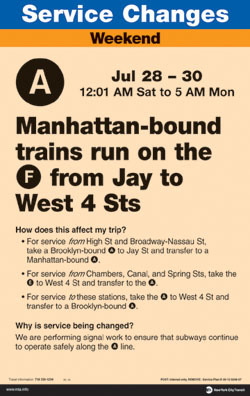 Many SAS readers have wondered if the MTA had engage in the practice of using weekend service diversions as a cover to cut train frequencies and increase headways on Saturdays and Sundays. It sounds almost conspiratorial, but a new report by the NYC Transit Riders Council reveals that weekend service — and signs warning about service changes — are lacking. The Council conducted its survey at 15 B division stations over four weekends this past fall, and its results are telling. Out of 168 trains expected to pass through their survey points, NYCTRC volunteers counted only 149 trains. Furthermore, actual headways counted by the volunteers differed from posted schedules by a significant amount with 28 percent of trains arriving at least four minutes later than they should. Beyond the actual service, NYCTRC also faulted Transit for its approach to service change announcements. Volunteers found “a mixed picture” of adequate signage. Overall, 75 percent of stations with mezzanine levels featured service change announcements, but not all stations, as the report notes, have mezzanine levels. The picture got worse as we descend into the system. Only 42 percent of platforms featured service advisory signs, and only 22 percent of stations featured these signs at street level before straphangers would descend to the fare-control areas. NYCTRC targeted the B division stations because those are not due for the PA/CIS system installation for at least half a decade, and in the interim, the Council urges Transit to “make every effort to inform riders when work in the system will make service less frequent or regular than would ordinarily be expected.” Riders should know before they head underground what to expect, and right now, they simply do not. According to amNew York, Transit is testing a new sign designed to clear up the confusion and seems to agree with the Council’s suggestion. Whether service will become more reliable or whether changes will be easier to figure out will be the real test of the authority’s willingness to respond to this report. The agency has also told us that the proposed weekend service cuts would actually match the train frequencies/headways caused by weekend work, and that, overall, straphangers wouldn’t notice a difference. If this is true, I’ve wondered how this would result in cost savings. I’ve noticed some trains on weekends as crowded as rush hour trains, which just feels wrong. There was someone who posted here once that he avoided using the subway on weekends, and while he got alot of criticism, I can really sympathize. The MTA should release a new map every weekend showing what the actual system running is. The subway map becomes nearly useless every weekend because you can’t expect the trains to run where and when the map says they will be. Weekend late nights? Forget it. The trains don’t run on a schedule. They come when they want to come. I’ve waited 40 minutes at 42nd Street for a 2/3 at 3am many nights (and when it comes, the train is standing-room only). 15 stations for 4 weekends is 60 data collection locations and they only expected to see 168 trains? Is that total or per weekend? 168 per weekend makes more sense but even then it’s an expected 11.2 trains vs. an actual 9.9. I dunno I think losing 1 train per period during construction is not a tragedy.